In a recent article we looked at quarterback passing tendencies – how frequently certain quarterbacks targeted various positions – to see if this couldn’t help us gain an edge in fantasy football. However, this article spoke only to volume and told us nothing of efficiency. Today, I wanted to look at how efficient each quarterback was when targeting each fantasy-relevant position. In the below chart we’re looking at all 24 likely starters with at least 1,000 pass attempts this past decade and measuring each quarterback’s passer rating (over the past decade) when targeting the following positions: running backs (halfbacks only, no fullbacks), wide receivers when running routes from the slot, wide receivers when running routes outside, and tight ends. In many cases it’s hard to divorce a quarterback’s efficiency ranking when targeting a specific position from the talent-level of the receivers who primarily played that position. For instance, how much of Tom Brady’s league-leading 127.0 passer rating when targeting tight ends is because he had the luxury of playing with Rob Gronkowski for the past eight years? 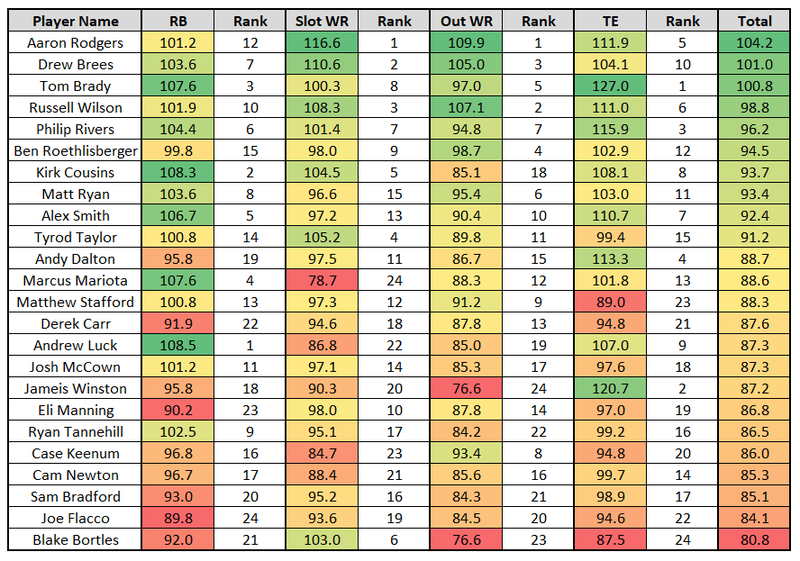 It will be my job in the analysis below to separate the signal from the noise and try to find instances where this ranking might be more useful for fantasy football players. Jameis Winston’s numbers here are pretty alarming. He’s our second-most-efficient quarterback when targeting tight ends (120.7) but ranks least-efficient when targeting wide receivers outside (76.6). That seems all the more remarkable when we realize 73 percent of those outside wide receiver targets went to one of Mike Evans, Vincent Jackson, or DeSean Jackson. 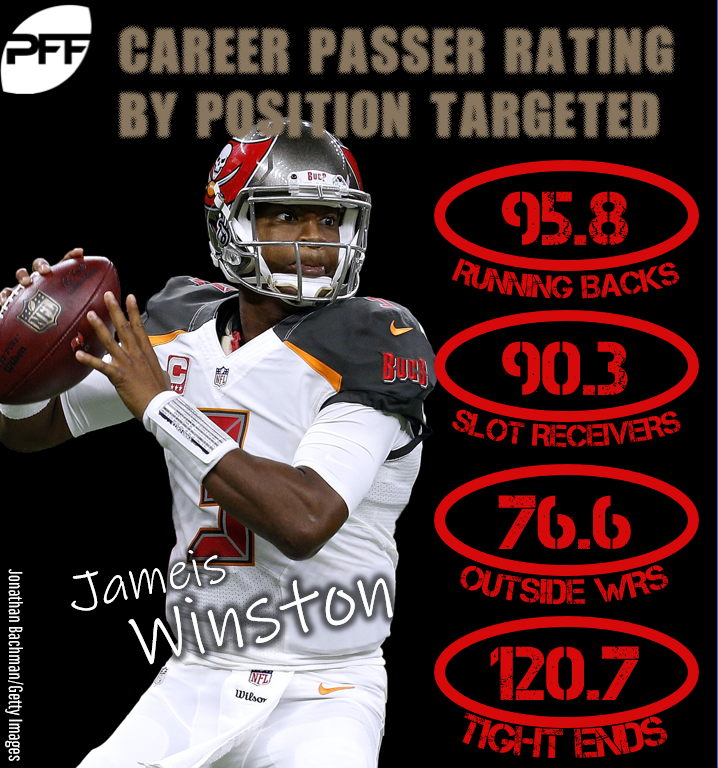 It’s hard to determine whether this has more to do with head coach Dirk Koetter’s scheme or Winston’s own deficiencies as a passer, but, in any case, perhaps Evans and Jackson might not suffer too much during Winston’s four-game suspension. Last season, Jackson averaged 4.2 fantasy points per game more in the four games Ryan Fitzpatrick attempted at least 25 passes in a game. Evans too averaged 1.7 more fantasy points per game when Fitzpatrick attempted at least 25 passes. Philip Rivers ranks third-best in passer rating when targeting tight ends (115.9), which makes sense given the impressive tight end talents he’s had throughout his career (Antonio Gates, Ladarius Green, and Hunter Henry). However, this year’s roster is a lot less impressive. With Henry hurt and Gates still a free agent, there isn’t a single healthy tight end on the roster to ever record even 25 receptions in a single season. In one stat, here’s why this is especially concerning for Rivers’ fantasy prospects – over the past two seasons, Rivers’ passer rating would have dropped from 91.9 (13th-best) to 86.6 (23rd-best) if we removed all of his throws when targeting Henry. It’s probably only a matter of “if” and not “when” Baker Mayfield takes over as the starting quarterback for the Browns this year. However, in the interim, it looks as though Jarvis Landry will benefit the most during games Tyrod Taylor is starting. Taylor ranked fourth-best when targeting wide receivers in the slot (105.2), but outside of the top-10 when targeting all other positions. Landry might still have the edge on Josh Gordon in Mayfield starts as well, considering Mayfield ranked first when targeting wide receivers in the slot (146.6) and third-best when targeting wide receivers outside (122.7) last year. Kirk Cousins ranks fifth-best among all quarterbacks when targeting slot wide receivers (104.5), with Jamison Crowder making up 45 percent of his career targets to wide receivers running routes from the slot. Considering he’s had stronger talents elsewhere (DeSean Jackson and Pierre Garcon outside and Jordan Reed at tight end), I think this is noteworthy. Adam Thielen and Stefon Diggs both have ADPs in the third round, but Thielen ran out of the slot far more often last year (51.1 percent to 24.0 percent). Interestingly, Blake Bortles ranks sixth-best when targeting wide receivers in the slot (103.0), but bottom-four when targeting all other positions. Allen Hurns appears the most-responsible for this ranking, making up 39 percent of Bortles’ career slot targets, but that number is still fairly low. So, perhaps this is good news for Keelan Cole, who we have projected to start out of the slot for Jacksonville this year. Aaron Rodgers absolutely dominates this chart, but it’s interesting to note he ranks fifth-best when targeting tight ends (111.9). Only once over the past five seasons has a Green Bay tight end posted top-25 numbers at the position. Only twice throughout Rodgers’ career has a tight end posted top-10 numbers for fantasy. However, Rodgers’ ranking here suggests the issue is more due to volume than efficiency. While Jimmy Graham is still probably too expensive at ADP (TE4), maybe I’ve been too pessimistic in earlier articles. Eric Ebron has been gaining in buzz all offseason and perhaps Indianapolis is a much better fit for him than Detroit. Andrew Luck ranks ninth-best when targeting tight ends (107.0), despite Coby Fleener accounting for 45 percent of his career tight end targets, while Matthew Stafford ranked third-worst (89.0). Still, it’s hard to get excited about either Ebron or Jack Doyle considering how rare it is for an offense to support multiple fantasy-relevant tight ends. Among 24 qualifying quarterbacks, Joe Flacco ranked last in passer rating when targeting running backs (89.8). This is quite surprising, considering he played with Ray Rice for six seasons (Rice is the only running back with multiple 700-receiving-yard seasons this past decade). Baltimore also ranks second in running back targets over the past three years (333). Despite Flacco’s inefficiencies when targeting the position, I think it’s likely Baltimore’s running backs rank highly in targets again next year. This could make one of Javorius Allen or Kenneth Dixon a strong ADP value as the team’s primary scatback. Saquon Barkley led all college running backs in receiving yards last season (632) and head coach Pat Shurmur said after selecting him in the draft, “The most important thing, and the first thing you look for in a running back is ‘can he catch?’” So, Barkley is undoubtedly going to see a lot of work as a receiver this year, but it’s interesting to note Eli Manning ranks third-worst at targeting running backs (90.2) among all quarterbacks within our sample. I wouldn’t read too much into this, however, considering Tiki Barber retired in 2006 and outside of the oft-injured Ahmad Bradshaw, Manning’s running backs haven’t been very capable receivers.